7DAYS EuroCup Top 16 Group E is comprised of three clubs with rich histories on the continental stage, however, it is EuroCup newcomer AS Monaco that enters as a regular season group winner. Joining Monaco are two-time champion Rytas Vilnius, former EuroLeague champion Partizan NIS Belgrade and 2010 EuroCup finalist ALBA Berlin. When Partizan hosts ALBA in Round 2, it will be a meeting of two former EuroCup Coach of the Year award winners. ALBA's Aito Garcia Reneses nabbed the honor in 2015 after leading Herbalife Gran Canaria to the finals. Partizan's Trinchieri received the trophy the year before for guiding UNICS Kazan to the finals. ALBA's top scorer, Rokas Giedraitis, played the past three seasons for their Round 3 opponent, Rytas. This will be the first time returning to play in his native Lithuania since he joined ALBA. Rytas guard D.J. Seeley played for Coach Aito at Gran Canaria in 2015-16 when they reached the EuroCup Semifinals. Rytas and Partizan have squared off before in both the EuroCup and the EuroLeague. 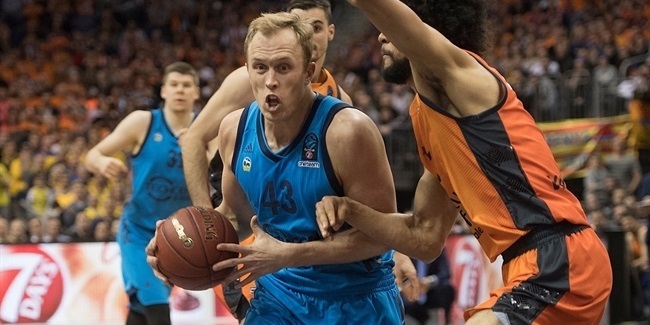 Rytas is 4-0 in their EuroCup games; the teams have split their four EuroLeague contests. Rytas has never lost to Partizan at home. ALBA won its only two previous games against Partizan, which were both in last season's EuroCup. 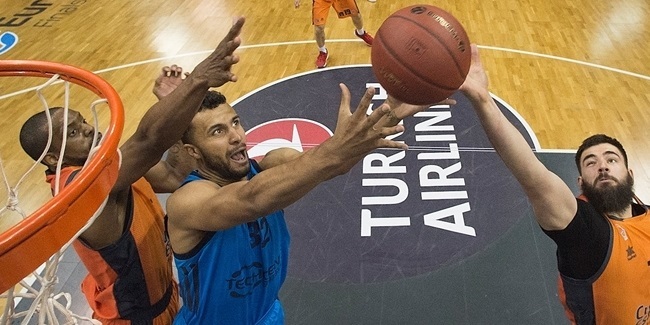 ALBA and Rytas have split their previous six EuroCup meetings, including two last season. Martynas Echodas posted a double-double to lead Rytas to a 94-73 home win in Round 9 of the regular season. Peyton Siva danced his way to 26 points, 9 assists and 3 steals as ALBA bested Rytas in Round 4. Monaco center Elmedin Kikanovic recently score the 1,000th point of his EuroCup career and became the 15th player to do so. One of his next targets will be to join the top 10 scorers in EuroCup history. Kikanovic trails Tre Simmons (1,066 points) by 65 points for tenth place. After averaging 15.5 points in 10 regular season games, Kikanovic should be able to reach tenth place during the Top 16. Moreover, his next two-point shot will make Kikanovic the all-time EuroCup leader in that category with 389. He is tied for 17th in career free throws made with 210 alongside Marko Marinovic. Ksistof Lavrinovic, who played for two of Kikanovic's Top 16 foes (UNICS and Rytas), occupies the tenth place with 233. New Rytas center Art Parakhouski is 15th with 59 career blocked shots in the competition. He needs 11 more to catch Viacheslav Kravtsov for 10th place on the all-time charts. Injuries limited Rytas playmaker Chris Kramer to just three regular season games, however, when he gets back to action he can resume his chase for a spot among the all-time assist leaders in the EuroCup. Kramer is 16th with 251 dimes, which is 45 fewer than Mire Chatman, who resides in 10th place. However, there are four active players between Chatman and Kramer, who could slow down his pursuit. Rok Stipcevic, who joined Rytas in the wake of backcourt injuries to Kramer, is fourth among active players with 120 career three-pointers in the EuroCup. That puts him 21st on the all-time charts and 4 behind Donatas Zavackas for 20th place. Sergey Monia of Khimki Moscow Region is 10th with 156. Rytas forward Dominique Sutton and Kramer are sixth and seventh, respectively, among active players with 76 and 74 steals, though they are a few back of the all-time top 50. ALBA big man Luke Sikma is second among active players in career rebounds with 381. He is ranked 16th on the all-time list, but he can move up the ladder quickly. Sikma needs just 20 more boards to crack the all-time top 10. Tenth place is currently held by Alex Mumbru. In a surprising coincidence, all four Group E squads finished the regular season with the same record (3-2) at home. That shows that they are all better at home, but also vulnerable. On the flip side, both Monaco and ALBA had winning records on the road. What's more, three of the teams have marquee wins on the road. Monaco romped to a 75-91 victory at Crvena Zvezda mts Belgrade in Round 7 thanks to 24 points on 6-of-9 three-point shooting and 6 assists from Derek Needham. ALBA stunned Lokomotiv Kuban Krasnodar 75-83 in Round 5 when Luke Sikma erupted for 18 points on near-perfect shooting plus 9 rebounds and 4 assists. Partizan bested LDLC ASVEL Villeurbanne 75-78 in Round 9 in a game it needed to win to remain in the playoff hunt. Jock Landale was perfect from the field in recording 15 points, 10 rebounds and 2 steals. Rytas averaged 97.0 points scored in a pair of road wins, but neither came against a team that reached the Top 16. Not one of these teams is pleased just to have reached the Top 16 and all of them are looking to finish in one of the first two spots to advance to the EuroCup Quarterfinals. To make that happen, each has made some pretty important additions to its roster over the past few weeks. Monaco snapped up center Eric Buckner after his short-term deal with fellow French side LDLC ASVEL Villeurbanne expired. In seven EuroCup appearances with ASVEL, Buckner posted 7.7 points, 3.9 rebounds and 1.6 assists per game. Monaco also returned shooting guard Sergii Gladyr, who played for the club the previous three seasons. ALBA brought in Cameroonian international Landry Nnoko for a trial and was so impressed that it signed the big man through the end of next season. Rytas fortified its frontline with old-school center Art Parakhouski, who led the EuroCup in blocked shots with Hapoel Jerusalem in the 2013-14 campaign. As for Partizan, the biggest acquisition was the mid-season hiring of Andrea Trinchieri as head coach in November. Now that Partizan has reached the playoffs, it would not be a surprise to see Trinchieri look to bolster the squad, too.